Summary: Ill Bell’s distinctive shape is easily recognised from afar. It’s rounded “bell” shape forms the middle peak of the long ridge between the Garburn Pass to the south and Thornthwaite Crag to the north. 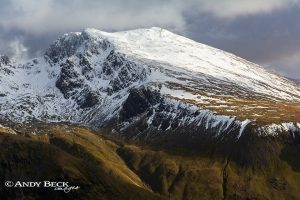 The neighbouring fells of Yoke and Froswick have a similar profile which gives the ridge a smooth waved appearance. Ill Bell was considered for inclusion by Wainwright on all lists. He mentions that on the 2 1/2 inch O.S. map of the day that it was named as Hill Bell, in fact it was also given this name on the 6 inch O.S. map published in 1899 and Hill Bell was a name used as far back as 1770. Curiously on the 1 inch map of 1898 the name Ill Bell was used whereas the 1 inch maps that AW generally referred to both called it Ill Bell and this is the name that is recognised today. 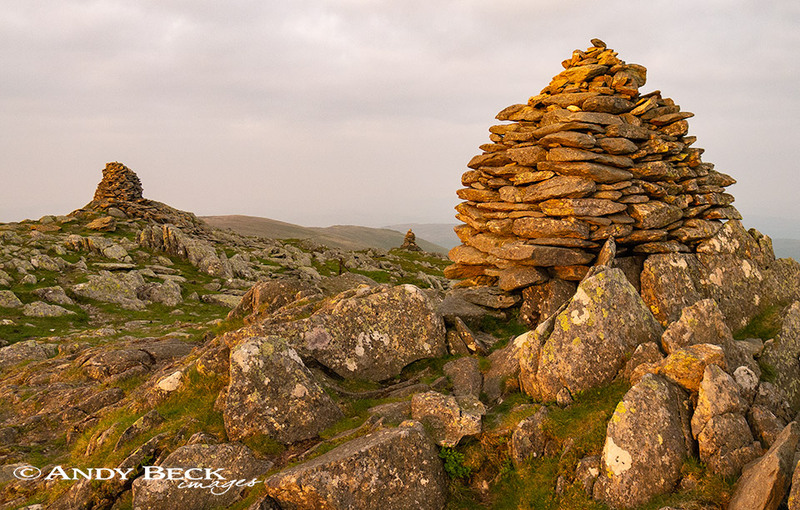 The summit has for many years been noted for the number of fine cairns adorning the summit area, Wainwright’s drawing in the Pictorial Guide depicted four but the one near the main cairn no longer exists, even the most southerly cairn is currently in a state of collapse but moves are afoot to have this rebuilt. The fell’s commanding height on the ridge means that it has far reaching views and on a clear day Pillar can be identified 17 miles away to the west. 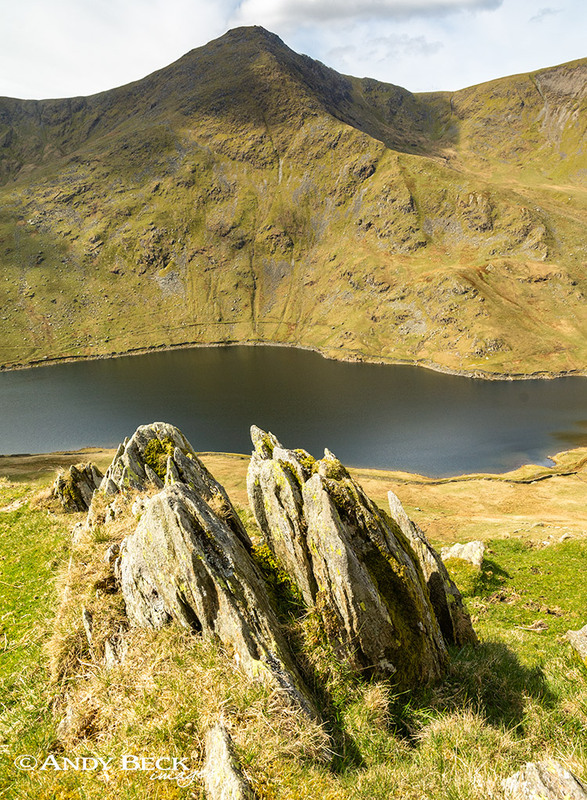 Most walkers will have visited the summit as part of the ridge walk and many do so as part of the popular Kentmere round which starts and finishes in the village as the southern end of the valley. However, my favourite route of ascent is via the steep north-east ridge, a challenging but not difficult climb to the top. Topographical details: The height given by Wainwright of 2476′ has been revised to being 2484′ 757m however the highest point has been identified as the most northerly cairn (the nearest in the photograph shown below) whereas Wainwright’s summit is at the large (middle) cairn seen on the left of the photograph at GR: NY43660 07720. Therefore whilst some other fell lists have this near cairn as the summit “Wainwrighteers” should visit the middle cairn which is slightly lower in altitude. Points of interest: There is a disused slate quarry on the western slopes of the fell (which I have yet to explore). Fine views south towards Windermere from the summit, good aerial views of the Kentmere reservoir from the top of the north-east ridge. The ridge is a fine route of ascent. 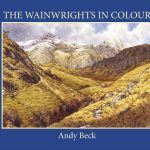 Adjoining fells: Yoke to the south and Froswick to the north both reached by easy ridge walking. Nearest facilities: Car parking in Kentmere, limited spaces near the village hall (honesty box), other parking can be had in a farmers field as you approach the village, small fee for all day parking and not open every day (mostly weekends in summer). Car parking also available near Troutbeck Church, limited spaces (free). Food, drink and accommodation in Troutbeck at The Mortal Man or The Queen’s Head. Tearoom at The Old Post Office, Troutbeck. Tarns: none on the fell itself, Kentmere reservoir to the east of the fell. Waterfalls: One is indicated near the old quarry on the western slopes (quality unknown). Star rating: (2.8 / 5) I have given Ill Bell a lower rating than it’s near neighbour, Yoke because despite it’s fine shape I feel that Ill Bell has less in the way of points of interest and the ascent route over Rainsborrow Crag beats the north-east ridge of Ill Bell.